The culinary student, pictured here at the 2018 A Taste of Success event, talks about the precision of pastries, gratitude for your scholarship support, and intense moments in the kitchen. 1. As a student at the Great Lakes Culinary Institute (GLCI) at NMC, you’ve found your passion in perfecting pastries. What is it about the sweet treats that made you specialize? I love the precision. I love seeing the end result, and am fascinated with the intricate design of pastries. Without a doubt, I’ve found my passion. I love sharing food with others and watching the excitement on their faces. 2. You grew up in Kalkaska, where you earned a 4.0 GPA and took Advanced Placement classes at Kalkaska High School. How did you find the Great Lakes Culinary Institute? I have wonderful memories of cooking and baking with my mom and grandma. My dream was to bake. My father is an accountant, and he encouraged me to think practically about my career. Then GLCI came to Kalkaska High School. They put on an event where they opened the kitchen and invited students and their parents to check out the school. It just felt like the right place for me. A tipping point for me was knowing that in the full associate degree I’d learn menu planning and purchasing along with cooking. My dad was happy, too. 3. You’ve worked hard and received multiple scholarships during your time in the program. What has scholarship support meant to you? I feel blessed and am so very grateful for scholarships. I’m able to follow my dream. Though I lean toward pastries, it was important to me to do the full associate program to become a well-rounded chef. I can do the full program because of scholarships. There are expenses on top of tuition, like a $400 knife set, coat and pants, and the cost of commuting to and from Kalkaska. I‘ve always worked hard, and it’s really rewarding to see my hard work paying off. 4. How has this program prepared you for the future? My instructors challenge me and push me out of my comfort zone, and because of that I’m so much more confident than I used to be. We’re required to do a 300 hour internship, and as an intern at the Grand Traverse Resort and Spa I learned a lot about mass production. Cooking at culinary events like A Taste of Success and the Lobdell Scholarship Dinner have made me much more comfortable during intense situations. 5. Can you tell us more about how fundraising events like A Taste of Success and the Lobdell Scholarship Dinner help you learn? They help me practice valuable skills like time management, organizing a menu, and preparing a buffet. Overall it’s a great application for what I have learned in my classes and provides me with real life experiences. I specialize in pastries, but what if someone asks me to sear salmon at an event? In these situations, I get nervous. But I can take what I’ve learned in the classroom and put it to use. 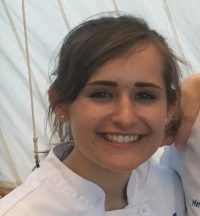 You can support Kathryn and her classmates on Friday, April 12 at A Taste of Success, the Great Lakes Culinary Institute’s premier fundraising event. You’ll support culinary scholarships and give students the chance to use what they’ve learned in class, all while enjoying international cuisine and local spirits. Tickets are on sale now.